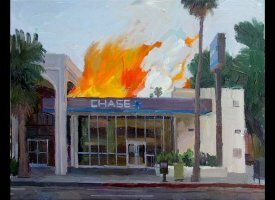 LOS ANGELES — Alex Schaefer is the hot Los Angeles artist of the moment, thanks to a couple of oil-on-canvas works showing banks burning down. Although his work has been displayed at several galleries over the years, Schaefer was mostly an obscure figure in the art world whose pieces rarely fetched more than $1,000. 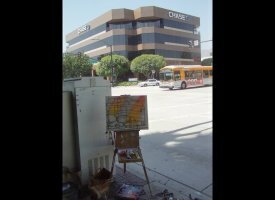 That was until he painted a picture of a nondescript bank on a run-of-the-mill San Fernando Valley street. 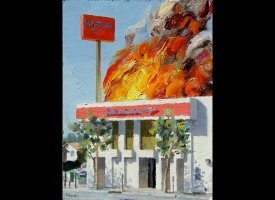 With flames leaping through the bank’s roof, the work began to take on a look similar to Ed Ruscha’s acclaimed 1966 “Burning Gas Station.” Schaefer says several passers-by stopped to give him a thumb’s up. Some, however, called police after their suspicions were aroused. 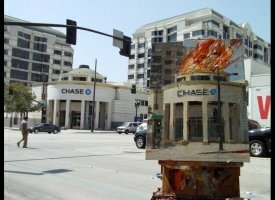 Offers for the painting began pouring in after the Los Angeles Times reported last month that authorities wanted to know if Schaefer planned to burn the bank down. He got so many offers that he decided to put the 22-by-28-inch oil on canvas up for auction on eBay. A German art collector who wishes to remain anonymous bought it last week for $25,200. Art by Alex Schaefer. Story continues below. 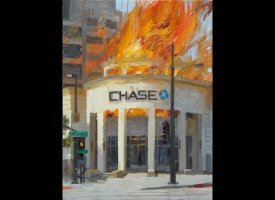 Schaefer says he told the police officers who visited him outside the Chase branch, and those who came to his home later, that the paintings were meant to be a metaphor for the financial havoc the banking industry has created. Several police detectives said Tuesday they didn’t know if the case was still under investigation, but hadn’t heard that it was. 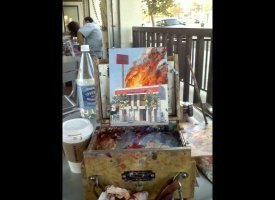 Schaefer, who teaches painting and drawing at Art Center College of Design in Pasadena, said Tuesday he is still in shock about his newfound success. 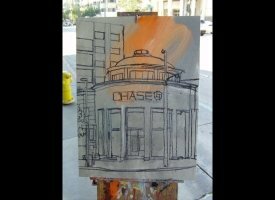 After selling his painting of the Chase bank branch, Schaefer decided to list a second, much smaller work that he painted while visiting his neighborhood Starbucks. 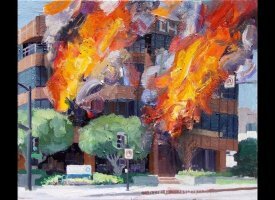 That one, just 6-by-8 inches, shows a burning Bank of America, a corporation with a bottom line that appears to be going up in smoke these days with its announcement that it’s laying off 30,000 employees after taking a huge hit in the mortgage meltdown. That painting sold for more than $3,500. “I really do feel very passionately about it,” Schaefer said of the economic woes he blames on big banks. 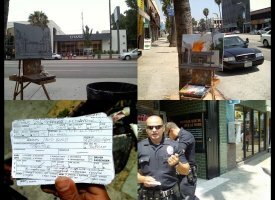 The prolific artist’s subjects aren’t limited to banks, however. They run the gamut from portraits to landscapes to a series he did on cupcakes. The 41-year-old artist says his greatest influences are the Old Masters, although he is flattered by the comparison to Ruscha. 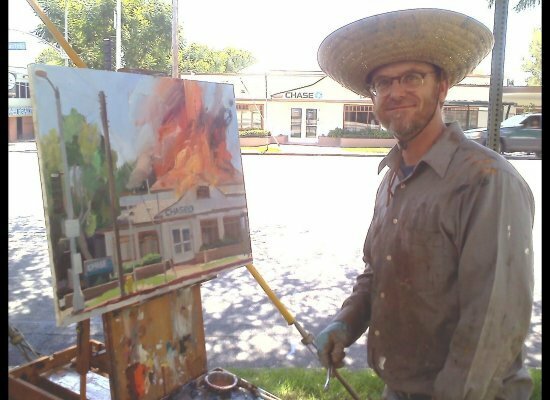 After earning a Bachelor of Fine Arts degree from Art Center, Schaefer worked for several years in the video game industry before deciding to concentrate on his painting and drawing. 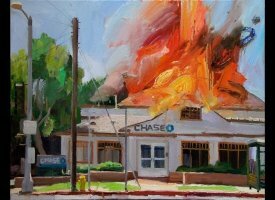 On Tuesday he was pursuing the banking theme again, working on another painting of a Chase branch on fire, this one in Pasadena. No police approached this time. Schaefer, who plans to exhibit some of his bank paintings at a show next year, said his two buyers have both invited him to stay with them if he should visit Europe. He added that he may take them up on the offer and expand his work to include the European economic crisis. “I might spend a week in London painting a bank on fire and then go out in the country and do three or four beautiful things,” he said.